LOS ANGELES — Last November, Walker Zimmerman’s own goal sent Real Salt Lake to the Western Conference semifinals. Saturday night, Zimmerman’s goal sent Real Salt Lake home with a loss. The center back’s strike in the second minute of stoppage time lifted Los Angeles Football Club past RSL 2-1 at Banc of California Stadium and to the top of the conference table. This marks the second stoppage-time victory of the season for LAFC, which beat Sporting KC in the opener thanks to Adams Diomande’s late winner. Does that make the wracked nerves worth it? Zimmerman admitted the shot took a slight deflection, but nonetheless he felt confident in the moment. On the front foot most of the night, LAFC equalized a few minutes later through Diego Rossi. It started with a great bit of link-up play between Carlos Vela and Blessing, who tried to play through Diomande but saw his pass tackled away. 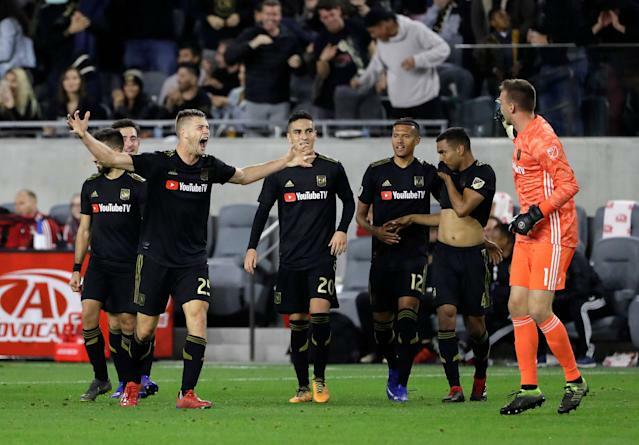 The postgame tenor at Banc of California Stadium was decidedly different than in last season’s MLS Cup Playoffs, when RSL beat LAFC 3-2 in the knockout round to end its debut foray into the league. Both sides were missing players Saturday due to the international break. RSL became the first team to start six homegrown players in MLS history and stayed compact to let the hosts play, which produced some nervy moments and several fine stops by Rimando but nearly proved to be the right formula. Portillo’s red card came when he raised his arm to Rossi’s face in an attempt to stop him from chasing down a ball. RSL’s opening fixtures have been brutal, with away losses already against the top team in each conference (it also lost 5-0 at D.C. United) as well as a draw at Houston, which is currently third in the West. So despite the setbacks, there figure to be calmer waters ahead. But LAFC will take the win and now has 10 points from 12 this young campaign. If the club can navigate a trip to San Jose next weekend, that would set up a showdown with Wayne Rooney and D.C. United in two weeks in the nation’s capital. What a thriller that could be. Might be tough to top Saturday’s finish.